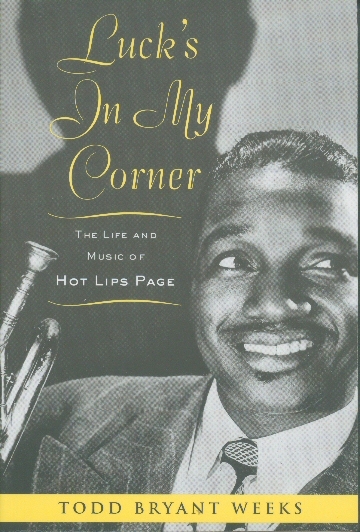 Luck's In My Corner - The Life & Music Of Hot Lips Page [weeks1234] : Jazz Record Center, Rare and out-of-print books, records and more. A comprehensive biography of one of the most compelling jazz musicians of the swing era. Weeks has traced in meticulous detail the path of Page's career, clarifying much that was obscure and questionable, and providing a perceptive musical analysis of his style and technique. He has also placed the man and the music firmly within the context of twentieth-century African-American and mainstream culture. Includes a new and complete discography and dozens of unpublished photos.